Located in the Yucatan Peninsula, Cancun is an intriguing blend of ancient treasures and modern delights. Renowned for its brilliant beaches, Cancun is also the gateway to archaeological treasures and splendid natural wonders. 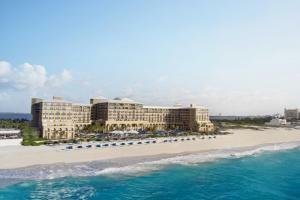 Nestled within is The Ritz-Carlton, Cancun, an exquisite retreat featuring memorable experiences. Enjoy the warm Caribbean breezes poolside, master the cooking style of the chefs at The Culinary Center, embrace the tranquility of Mayan-inspired spa treatments or let the sound of the waves accompany your dinner on the beach. On the beach in the Hotel Zone, 15 minutes from the airport. The Club Grill - AAA 5 Diamond Continental cuisine; Fantino -AAA 5 Diamond contemporary Mediterranean cuisine; El Café Mexicano - casual and comfortable dining inside or on the ocean view terrace; Casitas - Chic handmade cabanas are transformed into private dining rooms on the beach; Caribe Bar & Grill - oceanfront and poolside dining; D-Lounge – features a menu of shareable small plates, over 100 of Mexico's premium tequilas and an ingenious Margarita menu; Sushi Bar – Japanese-inspired cuisine; The Culinary Center – a 12-seat, residential-like seaside kitchen with a prix fixe creative chef menu; In Room Dining - Available 24 hours. Chichen Itza, Cozumel and Tulum, Cave of the Sleeping Sharks in nearby Isla Mujeres, Shopping.